Richmond’s public transit system will be seeing some big changes in the coming years. The first rapid transit line is being built, and the city is seeking feedback to improve the wider bus system. Catherine Komp has more for Virginia Currents. Learn More: Find out more about the Richmond Public Network Plan. Explore their interactive map to compare transit concepts and take the public survey until September 26. 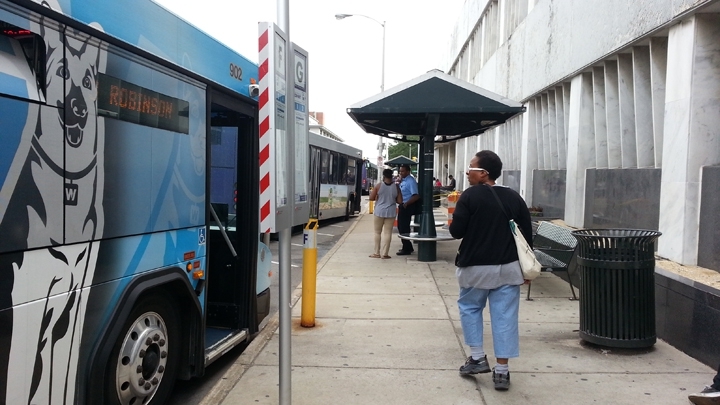 Read about the GRTC Bus Rapid Transit line Pulse and the advocacy group RVA Rapid Transit. At a bus stop near Gilpin Court, Priscilla Eggleston greets a mother with one year old twins. Eggleston has used Richmond buses for nearly 50 years and today, she’s invited us to ride along on a trip she regularly takes. Priscilla Eggleston: Since you got your walking shoes on, we’re going to go the not so lazy way and I’m going to show where we get off the bus compared to where we got to go to catch the next bus over, there’s a difference. We have about 20 minutes to wait off the busy intersection on Chamberlayne. Eggleston offers to hold one of the girls who’s getting cranky. Komp: So where are all the different places you take the bus? Eggleston: I’ll take it to church, I’ll take it to shopping, maybe go over to my sister’s house. When the 37 bus arrives, it’s packed. There’s no room for the mom, two infants and a stroller, so they have to wait for the next bus. We get off at Broad and 8th and walk to the temporary transfer plaza. It’s noisy and crowded as hundreds of buses and people converge here throughout the day. Many riders say the plaza lacks adequate amenities like enough shelter from the heat and cold, or convenient restrooms. We have about 30 minutes to wait here until our next bus is scheduled to arrive. Eggleston: Imagine it being early in the morning and you have to go through all of this. Public transit in Richmond goes back 160 years, says GRTC CEO David Green. When gasoline powered buses replaced the streetcars, he says they largely followed the exact same routes. David Green: And it's kind of that way today. We've made some minor changes and some improvements but by and large they operate on the exact same streets to the exact same areas that they did back in the early 1900s. And that’s not serving today’s public transit needs, says Green. But changes are in the works. GRTC and the City are engaging the public on a year long study called the Richmond Transit Network Plan. At a recently community meeting, the City’s Amy Inman joined Scudder Wagg, a transportation planner with the consulting firm Michael Baker International. Using an interactive map, Wagg demonstrates a “spectrum” of choices for improving the system. One is familiar, with little change. Another expands coverage; a third increases the frequency of buses to increase ridership. Scudder Wagg: In this design, you are generally minimizing waits by trading off a longer walk, so you have potentially longer walks but shorter waits. In this design, you’re making walks as short as possible, but your waits are longer. The idea is to find the point on the spectrum that best meets the needs of the community. GRTC’s funding has remained flat, so any changes need to work within the current budget. There will be tradeoffs, says GRTC’s David Green. Green: A high-frequency concept spaces bus stops out a little bit further and what that does is it requires a bus to stop less frequently so it speeds up your trip getting from point A to point B. By doing that you force people to walk a little bit further. On a high coverage route, they want bus stops as conveniently located as possible, they don't want to walk a whole lot, they want a lot of bus stops and if you have a lot of bus stops, the bus is stopping more often and it slows the service down so there are consequences based on how the system is setup. Older riders might not want to walk a long distance, but be okay with waiting says Green, while a young adult balancing school and work might want more frequency. Green: We did a study throughout 2015; it was targeted at five different groups in order to get feedback from the community about what they felt about GRTC and also transit in general. The two biggest things they said they needed in order to use transit were convenience and reliability, so again that gets back to frequency and how often a bus comes to the stop they need to use. Convenience and frequency is what the GRTC Pulse aims to offer. The 7 ½ mile long bus rapid transit or BRT system will run from Rocketts Landing to Willow Lawn. It would take an hour by bus today, says Green. Green: On BRT, it will take you about 30 minutes so it will cut your travel time in half. There are going to be 14 BRT stations once BRT is up and operating; if you compare that to fixed route buses now, there are about 100 bus stops between Willow Lawn and Rocketts Landing. Green says they get a lot of questions about the BRT’s usefulness along Broad Street, where a bus line already operates. But he says BRT is completely different and is designed to act like light rail. Besides having stations and fewer stops, riders will pay their fee before the bus arrives. One of the most important features - the buses have equipment that interacts with traffic lights, so they stay green longer. Green: So the buses don’t have to stop at red lights at intersections, the light will stay green, the bus can continue on through those intersections and it will keep going until it gets to the next station before it has to stop. Green says bus rapid transit is also a fraction of the cost of light rail. Green: To give you a comparison, our friends down Interstate 64 in Norfolk introduced light rail five years ago, they actually just celebrated their fifth anniversary. Their corridor is 7.4 miles in length, ours is 7.6 so it’s about the exact same distance. Five years ago it cost them $320 million to construct that service, that’s about five times greater than what it’s going to cost for our BRT line in Richmond. The city is also hoping “transit oriented development” will emerge around BRT stations, creating more economic opportunities. Several meetings earlier this year, facilitated by Smart Growth America, sought the public’s input on development around the Orleans BRT station on Richmond’s East End. Back on the 70 bus, Priscilla Eggleston and I finally reach our stop at the Forest Hill Walmart. The trip took ninety minutes from the time we got on the bus at Chamberlayne, not counting the time it took to walk from the house to the bus stop. If you worked out here, that would be two to three hours commuting each day. Now, we need to get in and out of the store before the next bus. Eggleston just needs some yarn and trash bags. Eggleston grabs some lunch to go and we hurry back to catch the Northbound bus already waiting at the stop. On the route back, we see elderly shoppers holding wheeled carts packed with groceries and other purchases. One woman picks up her grandchildren from school. A few in service industry uniforms are headed to work. We finally get back around Noon. Eggleston says there are definitely ways the transit system could be improved. Access to restrooms is a big concern. So is accessibility. Eggleston: As you saw the route that we took, the physically challenged people probably have a hard time. As you noticed we had to walk from Park A all the way to Park L and then you noticed the frustration we had to go through and you noticed when we had go to the bathroom, where we had to go. So if they can improve that, that would be better. For now, transit riders will have to make due. But construction has begun on the Bus Rapid Transit system, and the Pulse is expected to start running in Fall 2017. GRTC hopes the wider transit changes will also be implemented around the same time. Advocacy groups like RVA Rapid Transit are making sure the topic stays a priority. The organization links rapid transit to increased access to jobs, nutritious food and health care services in addition to an increased quality of life for all. They are calling leaders across metro Richmond to “unite in creating a first-class public transportation system.” For Virginia Currents, I’m Catherine Komp WCVE News.